This book represents the published version of Myk Habets’ PhD dissertation recently completed at the University of Otago under the supervision of Ivor Davidson. In the Introduction, Habets offers a brief outline of the history of the doctrine of theosis (or “divinisation” or “deification”) in both the Eastern Church (represented by Pseudo-Dionysius, Maximus the Confessor, John of Damascus, Symeon the New Theologian, Nicholas Cabasilas and Gregory Palamas) and in that of the West (here he considers Augustine, Aquinas, the Finnish School of Luther interpretation, John Calvin – in whose thought the notion of theosis finds its voice in the grammar of “union with Christ” – the Oxford Movement, the Wesleys and modern Pentecostalism). He suggests that T.F. Torrance functions as something of a mediating theologian insofar as his soteriology betrays a “creative continuity” (8) with both Eastern and Western notions of atonement and gathers them around “the controlling metaphor of theosis” (ix). Through an examination of Torrance’s doctrines of creation, anthropology, incarnation, reconciliation and spirit-ecclesiology, Habets identifies that while theosis is not the central point of Torrancean soteriology, and that “direct references to theosis within Torrance’s work are relatively few” (14), (Torrance prefers to employ the grammar of “union,” “communion,” “participation,” “atoning exchange,” etc. ), “it is a necessarily crucial integrating theme within his overall theological oeuvre” (16). Habets’ study examines these themes in their theological contexts and concludes that “what emerges is a complex but coherent Torrancean doctrine of theosis,” albeit one which raises “critical questions, deficiencies, and indications for further study” (15–16). Chapter One explores Torrance’s claim in The Christian Doctrine of God that creation is “proleptically conditioned by redemption,” that from the beginning creation’s telos is both revealed and actualised in the incarnation. With striking clarity, Habets outlines the mutual history that creation and redemption share, a history which is brought together in a creative synthesis in Torrance’s doctrine of theosis. This work of theosis is the purpose of Holy Love’s gracious determination to not live for himself alone but to bring into being an-other, namely creation, which might share, in Torrance’s words, “the Communion of Love” which constitutes the Triune life. This, Torrance insists in the aforementioned book, is the “secret of the creation, hidden from the ages” but has now in Christ “become disclosed to us” (218), secured in the act of God’s incarnation, and fruited in the human experience of redemption which comes as the gift of the Holy Spirit. Habets contends that while “Christ is central to creation as a whole, [and] not simply to humanity” (27), humanity is given “the function and privilege” to assist creation to both “realise and evidence its rational order and beauty and thus to express God” and to “realise its priestly vocation, in order to bring forth the requisite praise that God deserves” (45). In Chapter Two, Habets attends to the core of Torrance’s theology – Jesus Christ – and he outlines the redemptive nature of the Incarnation and how, for Torrance, Christ’s entire life concerns the work of divinisation. Rehearsing the central motifs in Torrance’s christology (namely, the retrospective/prospective aspects of the atonement, the homoousion, the vicarious humanity, mediation, and ascension of Christ, etc. ), Habets recalls Torrance’s indebtment to the Greek Fathers in “constructing a doctrine of theosis around two distinct but interrelated movements” that take place in the hypostatic union (a doctrine with significant epistemological currency in Torrance’s thought), namely the “divinising” of the human nature of the Logos and the subsequent application of this to the human subject in “deification” (55). So Habets: “In the person of Jesus Christ we see true humanity partaking of true Divinity by nature in such a way that by union, communion, and theosis with Christ by the Spirit we too, by grace, can participate in the divine nature” (62). The ultimate achievement of this divinising action is reached in the ascension of the Son: “As a man, Jesus Christ has perfect fellowship with God, and because of the eternity of the hypostatic union, the one person of the Son is in the ‘place’ (topos) and ‘space’ (chora) of humanity in and with God” (89). While otherwise sympathetic to Torrance’s theology, Habets charges Torrance with a “lack of detailed attention to actual historical life of Christ” (83), with misrepresenting patristic sources, with embracing a form of divine passibility which leaves his christology too ambiguous at points (see 84–7), and, more substantially, with a deficient and underdeveloped pneumatology, particularly that as concerns the bond of union in Christ’s theandric nature. On the latter, Habets contends that Torrance’s over-correction of Edward Irving’s apparent Ebionite christology leads to Torrance going “too far in the direction of Alexandrian christology” (74) and so under-emphasising the atoning work of the Spirit in Christ’s life. Habets turns, in Chapter Three, to examine the dynamics of how believers are brought into relationship with God. He properly highlights Torrance’s indebtment to Calvin (and to Barth) and argues that the Church’s doctrines of theosis are compatible with Reformed theology’s understanding of participation. In many ways, the discussion on union with Christ (97–115) takes us to the very heart of the Reformed account of the doctrine of theosis that Torrance represents. 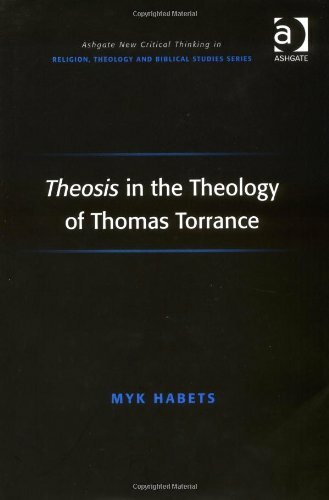 This informs Habets’ thesis that theosis functions as a “controlling metaphor that gives coherence to the disparate themes of Torrance’s soteriology” (94). Some readers may feel that Habets has overplayed his hand in proposing that the doctrine of union with Christ is determined by a deeper and distinct-though-related doctrine of theosis within Torrance’s theology; others, that Habets has not made his case, or that he remains too uncritical of the character of theosis that Torrance outlines and whether it remains too incompatible with the Reformed ontology with which Torrance otherwise operates. Habets is not unaware of these criticisms, however, and devotes some ink to wrestling with them. Throughout, Habets consistently avers that the hypostatic union means that humanity’s centre and God’s coincide, that in Christ the Triune God and humanity dwell in each other in mutual personal satisfaction in such a way that humanity is gathered up into the space of the triune community but without loss of creaturely status, nor blurring of the Creator–creature distinctives. Pneumatology and ecclesiology are the subjects of Chapter Four, “Community and Communion.” Here Habets, in the most constructive of the book’s chapters, argues for the indispensability of an adequate pneumatology (which is “perhaps the least examined aspect of Torrance’s theology” (140)) for a doctrine of theosis as “it is here that the reality of the believer’s participation in the divine nature emerges” (139). He notes that the same Holy Spirit who equips and enables the incarnate Son to offer the “wonderful exchange” for us is also the “bond of love who unites believers to the incarnate Son and enables them to be drawn into the life of God” as well as “the bond of communion who constitutes the church as the locus of theosis” (139; cf. 168–70). Habets (tentatively) agrees with Jason Yeung’s assessment (in Being and Knowing: An Examination of T.F. Torrance’s Christological Science) that while Torrance is right to never isolate pneumatology from christology, Torrance’s pneumatology remains under-developed. Moreover, Habets charges that Torrance’s robust emphasis on the objective elements of soteriology are not matched by corresponding subjective aspects. He recalls the gracious action of God who in/by/with the Spirit unites the Church to the response, obedience, faith and worship of Jesus, and raises that communion up in Christ to participate in heaven’s worship and in the eternal communion of the triune family. Put short, “theosis is worship from beginning to end, for it is an active participation in Jesus Christ made possible by the Spirit” (192). The “central ecclesial acts” in which “theosis occurs” (170), Habets notes of Torrance’s thought, is in Baptism and Eucharist. “Participation in the sacraments is … the path to participation in the divine nature, a mystery of the faith that unites the believer to Christ by the Spirit” (184). Baptism functions as “the liturgical mediation of forgiveness” (176), as the event through which believers participate in the incarnate Son’s theopoiesis, and as that action which “inaugurates theosis in the believer” (178). Habets understands that the Eucharist, like Baptism, is a mediating rather than a constitutive form of God’s saving action. Moreover, it is a form in which Christ’s real presence reflects the hypostatic movement evident in the incarnation and in Christ’s priestly work. In answering the question “How close is the union that believers have with God in theosis by means of the Eucharist?”, Habets recalls Torrance’s claim that “No union, save that of the Persons of the Holy Trinity, could be closer, without passing into absolute identity, than that between Christ and His Church as enacted in the Holy Eucharist” (182). The book’s conclusion draws together and recapitulates the main themes of the study before naming some concerns that the author has about some details of his subject’s theology, evidencing that Habets is a grateful though not uncritical reader of Torrance. Habets remains unconvinced, for example, of Torrance’s insistence that Christ assumed fallen human nature, that Torrance has done enough to articulate the compatibility between the model of theosis he is proposing and a Reformed doctrine of justification by faith, and that Torrance’s theology of unio mystica is pneumatalogically sufficient in those areas where the concern presses beyond epistemology. Moreover, Habets believes that Torrance’s theology of theosis, while compatible with the Church’s teaching and with contemporary scholarship, requires additional maturity, sophistication and some “specific discussion beyond that which he provides of what theosis ‘looks like’ in everyday life” (189). While the book could do with an additional proofread and edit (there are a number of typographical and grammatical errors, particularly in the footnotes), it joins work by Colyer, McGrath, Dawson and Molnar as an insightful and clear introduction to Torrance’s extensive oeuvre, and makes a real contribution to ongoing conversations about the shape and location that the Christian doctrine of theosis assumes in systematic and ecumenical theology, and in theological anthropology. Jason — Great review, but am left wondering: could you please comment on how you think Habets’ heterosexual lifestyle played into his view of Torrance? Particularly, I’d like to know how Mary metaphysically figures into his view of theosis, since I think they both likely led one of those heterosexual lifestyles. Without Mary in the mix, the whole thing just sounds a little gay to me. Thanks! Great review Jason, I was supposed to do one too — hopefully still will — but then was hit with this health thing. It is a great book, I found it very helpful in approaching TFT; and I think Myk provides a nice model for engaging TF critically. I’m going to have to re-read it soon! Thanks for the review Jason, I welcome any good critical interaction such as this!